It is usually assumed that the pedalling “in a circles” in order to transmit maximum power to the wheels possible only using clipless pedals. This is not quite true. Pedalling in a circles highly desirable at any pedals. 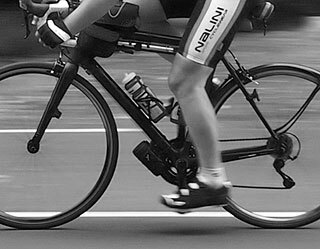 Fundamental difference – in a quarter of a turn when the foot comes up – “Contacts” work, while the usual pedal – not. But if you dig deeper, the situation is much more complicated and the benefits of contact pedals are not so obvious even in this quarter of turn. Need to say that under “normal” pedals, not meant smooth plastic, but pedal with spikes that provide a good grip with the sole in motion in all directions other than straight up. Therefore, the circular pedaling is not only possible, but highly desirable. Of course, the circle is not closed, 3/4 of it because of from the pull-up remained only first movement. 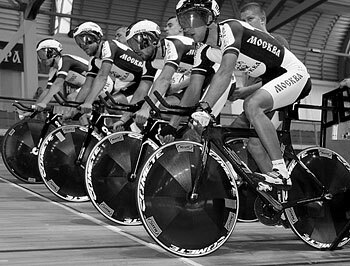 Regarding pedaling in a circles in the network it is a wonderful work of 2007: “The perfect pedal stroke”. Here is a picture from the article. It is interesting to note the position of the bottom with a raised heel. In my case, it is the most natural position when pedaling in conventional pedals. In the “Contact” I have a foot horizontal, tell why later. 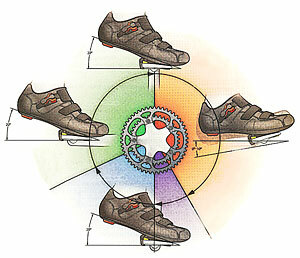 An important advantage of the “contacts” is considered the activation of groups of muscles that pull the pedal up, while with conventional pedals, therefore, they are not used. But this figure is striking a huge difference in the transmission power. Power motion while foot up incomparably less than while movement of leg down. Simply put, if you cut back quarter of a circle in the diagram, the total capacity will fall quite negligible. A man has quite a lot of muscles on his feet. Stephen Thordarson directly measured work of 7 muscles (in a cycles pedalling). An interesting graph was published, which I for clarity laid out on the muscles. It is evident that all the muscles from back side of the leg, which was thought only pull up, operate mainly in a downward motion. Moreover, all the muscles are working at a considerable part of the circle rather than in the “on-off” manner. As in the previous figure, during move up all the muscles produce minimum of power. 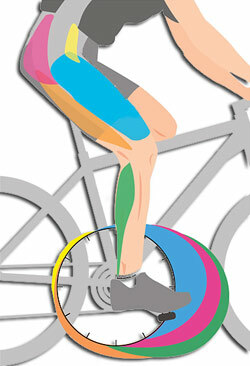 In principle, this is in accordance to the article “perfect pedaling”, which is mentioned in the beginning. It says that in the phase of “leg up” the main thing – do not impede to the opposite leg, which goes down, developing a maximum power. In this regard, I met also an interesting observation: the muscles for pulling is slower than for pushing. Legs are designed so that the jump up occurs more dynamic than the landing after a jump. Thus, in steady rotation in the “medium” speed or rotation (do not specify values, they can be different for alls :)) actually there is no differences between conventional pedals and clipless. Nevertheless, the advantages of clipless pedals are present. But they are not so much related to the circular pedaling. I can mark two advantages. 1. Due to the fact that the legs are fastened to the pedals, they do not come off pedals at high speed of rotation. That is, if necessary, one can spin faster than his technique allows. 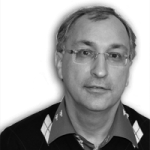 It is unlikely that this will be usefull, but nevertheless such a possibility is present. 2. Still, pulling leg up. Not on steady high-speed a circle rotation, but during powerful rotation in low frequencies. For example, when accelerating from the start if you need to quickly roll out in high gear. But most importantly, when driving hardly uphill. It is unlikely that you can talk about the work of muscles as in the above studies. Pretty good feel that when one foot slowly presses down, the second one pull-up hitched pedal with a smooth smear effort in a circle, and it is much better than only pressure down on the flat pedals. Actions are more like a start of steam locomotive than to pedaling in circles 🙂 In steady rotation such feelings is also possible to catch at a reduced cadence, when also “asking” hardly forced pedalling. In my case it cadence of 60-75 rpm. Previous Previous post: Bicycle in city. Flat or Clipless pedals?